Tourism Technology: Meet the QR Code Scanner! Since 2012 they’ve distributed two types of printed holiday coupon cards, also referred to as ‘passes’. 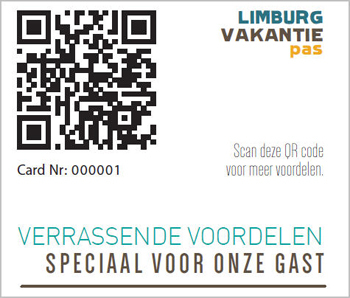 One pass is for visitors that stay overnight in Limburg and the other is for tourists that come for just one day. With these passes, tourists can get discounts at several attractions. With 20 merchants participating in the program, each with different discounts, specific terms and a variety of POS systems, Toerisme Limburg was faced with a significant logistics challenge. To expedite redemptions, they wanted to use scannable barcodes. To do this with 20 different cards, each with a unique pass ID would be impractical. Another problem they encountered was tracking redemptions so they could gauge the program’s effectiveness and generate data to improve future programs. Toerisme Limburg’s manager of new media, Philippe Marcisz, decided the only practical way to uniquely identify passes would be to use a single, unique ID for each pass that would be redeemable at any merchant location…The merchant would scan the pass’s barcode and the app post-scan records in real-time to a user-facing Web service…He chose QR codes as the barcode type because they could not only embed the pass ID but also enable scanning with the consumer’s own QR app. Kudos to the innovate Philippe Marcisz of Toerisme Limburg and BooQi Media Solutions for a job well done!